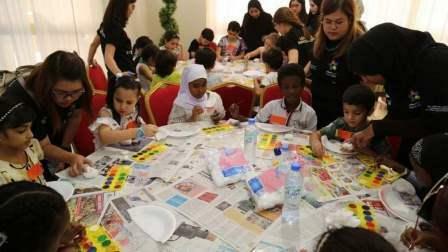 Over 400 volunteers have come together to host a summer camp for orphans and children from low-income families in Ajman and Ras Al Khaimah. Through the 'summer camp' edition of Dubai Cares' Volunteer Emirates, the volunteers will engage and interact with children through various educational activities - games, art and crafts, sports, music, general awareness, a reading club, math and English enrichment, as well as a field trip. The camp, which kicked off on Saturday in partnership with Al Ihsan Charity Association, will run until July 26. Abdulla Ahmed Al Shehhi, Chief Operating Officer at Dubai Cares, said: "We are proud to have introduced a week- long summer engagement with Al Ihsan Charity Association beneficiaries, most of whom are orphans and unable to enrol in thoughtfully curated summer programmes. The camp has been designed to help children acquire improved social and personal assets that will contribute to increased levels of confidence, happiness and positive behaviour." Mauline Rantugan, one of the volunteers, said: "Through Dubai Cares' commitment and the volunteers' dedication, we hope students will enjoy a fun and educational break from routine."